On Sunday 17 August Chris and I joined Penny for a trip down the Hinksey Stream. 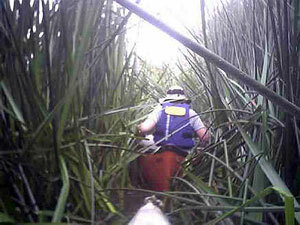 We were warned to bring a stout stick and a knife, so clearly a little reed cutting might be necessary. As we only had a breadknife or a little pen knife, Chris brought his sickle, which we tucked under the kneeling mat, in true Health and Safety style. If it hadn't been for the sickle I don't think we would have made the round trip. 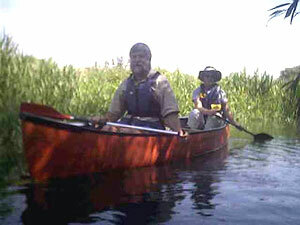 We started off up the river, Penny in her little kayak and Chris and I in an open canoe. We first had to negotiate an assault course made necessary by a busy regatta - novice canoeists didn't seem particularly welcome! Once past all that, we paddled peacefully up to Folly Bridge, where, as a small diversion, we rescued a life ring tossed by joyful revellers over a stake in the water. As responsible river citizens we stopped at Osney Lock and handed it to the assistant lock keeper. Back on course again, we made our way down Bulstake Stream. While Chris and I admired the view, Penny suddenly shot into the undergrowth on the left - apparently there was a stream off to the side and we were to follow her in to the darkness. 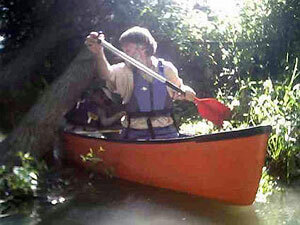 The stream was extremely choked up and as Penny fought her waythrough with her slim kayak and flailing double paddle, we inched our wayalong in the wider canoe, Chris hacking away with his sickle and me pushingand pulling from the back. Suddenly it cleared and we were at the Fisherspub. Pulling nettles and fragrant wild mint from our hair we made our way trimphantly to the bar. Duly refreshed we carried on round into Hinksey Stream, which continued to be with abundant growth, including reeds, nettles, mint and very scratchy hawthorn. Progress was extremely slow, but Chris enjoyed the heroism of exploration I think. As we came round underneath the bridge into Hinksey Park we met a couple who couldn't believe that anyone was canoeing along there. Sensing potential new recruits, Penny (as Admiral of the Fleet) got out and told them about the club. We paddled peacefully on round to Weirs Mill Stream, went under Donnington Bridge, carried the boats up beside the Lasher to join the Isis again and emerged through the old swimming pools into the tail end of the regatta.